President Evo Morales’s policies on the cultivation, sale, and manufacture of coca leaf are inspiring a variety of economic opportunities in Bolivia’s rural areas on the eastern slope of the Andes Mountains. Coca is an ancient crop valued in Bolivia for its medicinal and nutritional properties, as well as for its deep historical roots in Aymara and Quechua traditions. As it is also the source of cocaine, coca policy draws constant public scrutiny. In coca growing areas previously considered illegal under the U.S.-backed antinarcotics Law 1008, peasant farmers are now allowed to grow a limited amount of the leaf for personal traditional consumption and small-scale trade. The coca grower—or cocalero—movement hopes to tap into international markets with new investment in factories to manufacture export goods processed with coca derivatives. And, perhaps most significantly, Morales and his administration are actively diversifying their sources of foreign aid to support these new projects, a pragmatic move which seeks to end the unilateral influence over coca leaf policy that the United States has exercised for more than two decades. All of these changes offer a boost to Bolivia’s legal coca economy, one of the nation’s most important economic sectors. A strong agricultural economy also positively impacts the secondary and tertiary sectors—such as healthcare, education, construction, and transportation—that develop around it. However, this expansion of coca production also threatens to undermine the prosperity of the cocaleros in the traditional cultivation zone, for their exclusive protection under Law 1008 to grow and sell the leaf has now ended. This change highlights a division within the coca grower movement which Morales will need to address as his policies continue to be elaborated. The traditional coca growing zone of the Yungas valleys of La Paz has a very different history than the Chapare where Morales and the original cocalero movement gained political power. Bolivian coca growers are not a uniform group, as is often implied in international media coverage. The cocalero movement contains at least two factions with often conflicting interests. However, there are important commonalities that hold the potential for a unified agenda, especially given the democratic nature of Bolivia’s public debate around the current changes to coca leaf policy. Beginning perhaps 1000 years ago, the Aymara and later the Inca civilizations cultivated coca leaf in the high subtropical Yungas valleys. The Spanish took over coca cultivation and trade in the colonial era to supply the silver miners in Potosí. Their haciendas persisted in the Yungas until the Revolution of 1952. Since then the land has been owned in small communities by indigenous families who, as part of a diversified rural livelihood strategy, grow coca to supply domestic markets for chewing, tea, and medicines. Because of this history, in 1988 the Yungas was designated the primary legal cultivation zone under Law 1008, which allowed 12,000 hectares (30,000 acres) to be cultivated there. (The law identified the Vandiola Yungas, a small region near the Chapare, as the other legal zone.) All other coca production, including that in the Chapare, was deemed illegal and subject to transitional or immediate eradication. “Alternative development” programs occasioned the investment of millions of U.S. dollars in both the Chapare and Yungas regions, but they have been largely ineffective in providing viable substitutes for the coca economy. While Yungas cocaleros have supported Chapare farmers in their resistance to U.S.-funded militarized eradication maneuvers, many in the Yungas vehemently defend their status as traditional cocaleros and feel threatened by any measure that seems to undermine their economy and cultural heritage. Evo Morales’s rise to the presidency was set in motion by his effectiveness as a leader in the coca grower movement resisting U.S. intervention and forced coca eradication in the Chapare. The repressive measures employed in the Chapare as well as the persistent global demand for cocaine have helped spur an increase in coca production in and around the legal zone of the Yungas over the past five years. Many also argue that the legal market for the leaf is larger than Law 1008 recognizes, as it was based on data from the 1970s that no longer reflect Bolivia’s current demographics and consumption patterns. The U.S. stepped up its alternative development initiatives in the Yungas region in the early 2000s, while many cocaleros began demanding an expansion of Bolivia’s legal coca market to accommodate the increased production and potential for legal exports. Only one militarized eradication measure has been undertaken in the Yungas. In June 2001, President Hugo Banzer sent troops into the Sud Yungas to destroy 1700 hectares of “excess” coca plantations, what the U.S. said then existed beyond the allowable 12,000 hectares. Thousands of campesinos gathered in Chulumani to protest such interference with their productive livelihoods and demand a dialogue with the government. This collective diplomatic resistance was an expression of solidarity between traditional cocaleros and the more recent colonizers when faced with forced eradication. In 2004, however, a succession of road blockades and counter-blockades along the Yungas trunk road was staged by different groups of coca growers in an attempt to promote their differentiating interests as coca production increased. A new anti-drug installation called the Rinconada, located at the entrance to the Yungas region near La Paz, symbolized shifting Bolivian and U.S. policies that carried the threat of militarized eradication in the Yungas. Traditional growers began to defend their unique right to legally cultivate and sell coca leaf, while new colonists began to demand entrance into the legal market in the midst of an enervated national economy. Several public events—most notably a Coca Summit and a Coca Fair—were held in La Paz to raise awareness of these issues and facilitate dialogue among Yungas (and Chapare) agrarian leaders. This situation, which intensified during the 2004 municipal elections, divided Yungas cocaleros into two factions: “protectionists” (from the traditional zone) who want to defend their localized niche economy, and “nationalists” (mostly from the more recently colonized areas in and around the legal zone) who want to expand the coca economy. Because of the extreme topography and depleted soils of the highland Yungas, the protectionists argue that coca is their only viable crop, and that the more tropical lowland environment of newly colonized regions can support a wide variety of products. On the other hand, the nationalists (a much larger group) are eager to erase the inequity that Law 1008 established in allowing only one primary region to obtain income from the legal coca economy. In spite of these opposing interests, both factions have a similar agenda that endorses the industrialization of coca leaf in order to protect agricultural livelihoods, strengthen the regional economy, and promote international exports. This agenda is linked to several other shared goals: 1) focus on development with coca, as opposed to coca substitution; 2) depenalize the export of the raw leaf for chewing and tea; 3) develop medicinal, cosmetic, and nutritional products that use coca derivatives; 4) alter the international image of coca leaf with an eye toward declassifying coca as a narcotic at the United Nations 2008 Vienna Convention; 5) denounce the fabrication and trafficking of cocaine; and 6) promote the participation of cocaleros and other indigenous agriculturalists in local and national politics. In the 2005 presidential elections, the protectionists tended to support the U.S.-favored neoliberal candidate Jorge Quiroga—who would have safeguarded Ley 1008—while the nationalists (including Chapare cocaleros) tended to vote for Evo Morales and his pledge to decriminalize coca cultivation. As president, Morales aims to permanently eliminate militarized eradication as a way to reduce internal conflict and reclaim Bolivia’s national sovereignty. His agenda honors cocaleros as agents of their own development and draws them into the process of curbing the cocaine trade in order to end their role as simply passive recipients or opponents of imposed initiatives. True to his campaign promises, Morales has implemented several measures to even out and ameliorate the social and economic impacts of the increase in coca production in the Yungas. On June 17, 2006, the president announced his “rationalization” and “commercialization” plans to leaders from all six Yungas agrarian federations (La Razón 6-18-06). The rationalization plan eliminates the division of Bolivian territory into legal, transition, and illegal zones by allowing each cocalero union member in any preexisting coca growing region to grow one cato of coca. The commercialization plan allows licensed growers to sell part of their coca directly to consumers instead of having to sell to intermediaries who have until now controlled most of the transport and sale of the leaf. These reforms permit campesinos to use small quantities (150 pounds every three months) of coca leaf to trade directly for other goods and services. These changes will require the development of an effective licensing and monitoring system. Another important development in the Yungas region under the Morales administration is the restoration of two factories in Coripata and Chulumani (as well as a new installation in the Chapare) for the industrialization of coca leaf products for export. These factories were built in the 1980s with funding from the United Nations’ Agroyungas project, but they fell into disuse from a lack of government and international funding during the escalation of the U.S. “War on Drugs” that prioritized the substitution of coca crops. With new funds from the Venezuelan government, these plants are beginning to manufacture bagged coca tea and coca baking flour. Finally, Morales’s Vice ministry of Coca is negotiating with Yungas cocalero leaders a proposal for the “gradual and systematic” cooperative eradication of excess coca cultivation in the Yungas and surrounding areas (La Razón 7-29-06). The paradigm shift here is that instead of imposing sometimes violent eradication measures or cocaine lab busts—which only provoke an insidious cycle of pressure and resistance—the rural antinarcotics force, UMOPAR, is now actively educating Yungas cocaleros of their rights and responsibilities in these endeavors and inviting their input and collaboration. Morales’s new approach to fighting the drug trade aims to increase its efficacy and lessen police violence. By adding new commercialization and industrialization options while limiting the amount of coca that each union member grows, more families will be able to benefit from growing coca. It is also the hope that providing more legal market alternatives will not only prevent coca from entering the drug trade, but will allow it to form part of a new national economy that can support more indigenous communities. Furthermore, industrialization of legal coca products has the potential to benefit coca growers in both traditional and newly colonized zones, as well as others who will become involved in the factory work, distribution, and marketing, on the national and eventually international levels. It is important to understand that Morales is, in part, simply providing formal recognition of the new socio-economic practices that are already being carried out by a large segment of the population—a segment that has been historically excluded from the benefits of dominant Western economic models. In other words, he rejects criminalizing people who grow coca leaf as a means to support their families, or people who use the leaf to trade directly for other goods (as has been practiced in the Andes for millennia). Laws that reflect and honor a grassroots shift in everyday practice are far more effective than those that attempt to force a change in people’s habits to fit some externally imposed ideal. While President Morales is addressing these complicated and contentious issues with a level of creativity that has inspired wide national and international support among NGOs, businesspeople, academics, and activists, Yungas cocaleros who are not in favor of broadening legal coca cultivation and markets continue to oppose these initiatives. Those who have until now enjoyed the exclusive right to grow and sell the leaf are facing a major change to their livelihood, and their position will affect the process of debate and reform during this transition. The Yungas is a testing ground for Morales’s policy. It will be important to unite the different factions of coca growers behind his decriminalization agenda to avoid a revival of popular protest around this issue. Traditional cocaleros complain that the president’s commercialization and rationalization resolutions allow cocaleros from previously illegal zones to increase production and create new markets for the leaf before an adequate economic assessment of these changes has been made or publicly debated. While Morales has been calling for many years for a study of current non-narcotic coca consumption patterns (in Bolivia and surrounding countries), and while the European Union has demonstrated an interest in funding it, the study has yet to be carried out. The Bolivian government hopes that its plan to reduce coca cultivation to one cato per union member in established coca growing regions, rather than continue the ineffective norm of delimiting ill-defined legal zones (in which a maximum area under cultivation per person is not stipulated), has the potential to actually reduce the total amount of coca leaf produced in the nation. A central goal of the Morales administration is to improve its ability to fight the drug trade without resorting to the violent measures so liberally applied under previous administrations. Instead of engendering resistance from cocaleros when they are treated like enemies of the state—whether in the Chapare or the Yungas—Morales’s approach has the potential to build on the common ground that exists on both sides of the movement to inspire collaborative reduction of excessive coca cultivation, prevent profiteering by a protected minority, and divert coca from the cocaine trade. After two decades of enforcing its militarized coca eradication policy with impunity, the U.S. government is struggling to redefine its role in Bolivia. On June 26, 2006, White House antinarcotics policy chief John Walters said, “The level of current cooperation [by the Bolivian government] is not like it was in the past…. More coca and more cocaine are not good for Bolivia” (La Razón 6-27-06). In September 2006, the Bush Administration laid out six conditions for Bolivia to be “certified” to receive foreign aid, which includes the elimination of the cato provision. 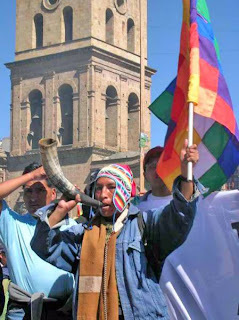 A Wall Street Journal opinion piece even proclaimed that “Evo Morales is an anti-American extremist” who is hyping the impact of the U.S. War on Drugs “in his bid to become a dictator.” Unfortunately, reactions in the U.S. to Bolivia’s changing coca leaf policy continue to be based more on uninformed fear than reasoned understanding. Morales and his administration need to continue to elucidate to the international community the difference between coca and cocaine—as Morales did in his speech to the UN General Assembly last September—particularly as Bolivian representatives plan to lobby for the declassification of coca leaf as a narcotic at the 2008 UN Vienna Convention. U.S. policymakers need to take into account Andean peoples’ deep cultural roots in democratic governance and the legitimacy of the cocalero movement to better understand the logic behind Bolivia’s new coca leaf policies. The ongoing process of negotiation around these policies in the Yungas and the rest of Bolivia is a case in point—agrarian leaders are using democratic means to publicly debate their ideas, resist foreign control, and hold Morales accountable for the viability of the legal coca economy. * Caroline S. Conzelman is a Doctoral Candidate in the Department of Anthropology, University of Colorado – Boulder. She conducted 20 months of ethnographic fieldwork in the Yungas in 2001, 2003-04, and 2006 with support from a Fulbright Grant, a David L. Boren Fellowship, and the University of Colorado. Her dissertation analyzes the relationships between the indigenous trade union form of community, or sindicato, democracy and the liberal representative form of municipal democracy in the Coroico municipality of the Nor Yungas province, part of Bolivia’s traditional coca cultivation zone. Please send comments to: conzelma@colorado.edu. The aid will boost efforts to develop legal commercial products from the crop used to make cocaine. CARACAS, VENEZUELA — Venezuelan President Hugo Chavez has found a novel way to dispense foreign aid: by promising to underwrite coca production in Bolivia. Officials here confirmed Wednesday that Venezuela would buy whatever legal products Bolivia could make from coca leaf, as part of that central Andean nation's attempt to wean farmers from the cocaine industry. Chavez's promise could finance the production of about 4,000 tons of coca in Bolivia, Venezuelan officials say. Possible coca-based products include soap, bread, herbal teas, toothpaste, unspecified medicines and cooking oils. No dollar amount for Venezuela's support has been announced. Three factories are under construction in Bolivia with Venezuelan financial and Cuban technical support, and production could begin this summer. First announced last month by Venezuela's ambassador to Bolivia, Julio Montes, the deal is being finalized this week in Caracas during meetings of the two countries' foreign ministers. The pledge is the latest in a series of foreign aid promises in Latin America as Chavez tries to expand his influence and promote his "Bolivarian Revolution." Among his foreign aid programs is a promised refinery for Nicaragua, cut-rate fuels for Ecuador and continuing bond purchases from Argentina. Chavez's promise is a big step in Bolivian President Evo Morales' efforts to legitimize the production of coca leaves, a crop Morales once grew. The announcement comes as the United States government is scaling back its anti-drug funding to Andean nations, including Bolivia and Ecuador. Chavez has long supported Morales' efforts to find commercial markets for coca-based products. Indigenous communities in Colombia and Peru, who claim the leaf is sacred, have attempted to promote commercial, non-cocaine uses of coca in soft drinks, cookies and anti-arthritis ointments. Botanists have extolled the nutrients that the leaf contains. But such projects have been opposed by the U.S. government, which sees the export of any coca product as a violation of the Vienna Convention, an international accord whose signatories agree the coca leaf is a dangerous substance that should be banned. Morales announced in December that he intended to expand legal production of coca in Bolivia to 50,000 acres from 30,000 acres by 2010. The United States protested, saying that Bolivia needed only a fraction of that acreage to supply domestic needs. The coca deal will do nothing to lessen the animosity between the Bush administration and the Chavez government. That hostility was evident Wednesday at a congressional hearing in Washington during which Secretary of State Condoleezza Rice said democracy and human rights were under attack in Venezuela. "I do believe that the president of Venezuela is really, really destroying his own country, economically, politically," Rice told lawmakers. But the Venezuelan and Bolivian governments made it clear that U.S. objections would not affect their plans. Venezuelan Foreign Minister Nicolas Maduro, appearing Tuesday before reporters with his Bolivian counterpart, David Choquehuanca, said the two nations were working on projects to "value and dignify the coca leaf." Venezuela, Cuba and Bolivia recently signed the so-called People's Trade Treaty, outlining cooperation and about $1 million in investment on coca production research.